Judea or Judæa (Hebrew: יהודה, Yəhuda; Arabic: يهودية, Yahudia, Greek: Ἰουδαία, Ioudaía; Latin: Iudaea) is the name of the mountainous southern part of the region known as Land of Israel and Palestine, roughly corresponding to the southern West Bank and northern Negev desert in Israel  The region is named after the biblical tribe of Judah and associated with the Kingdom of Judah. 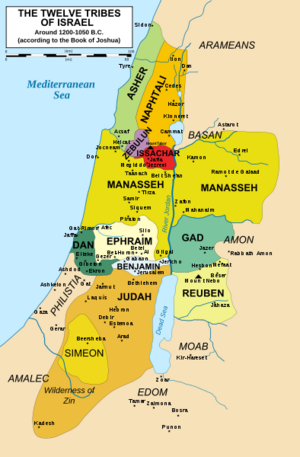 Judea as a geographical term first appears in the Bible in Ezra 5:8 , designating a province of the Persian Empire. During the days of Darius, Judea was a small dependency in his two million square mile kingdom. Darius found in his archives the decree of Cyrus which authorized the construction of the Temple. As a result, he ordered a generous contribution from the royal treasury. In 63 BC the Roman general Pompey made a settlement which reduced Jewish territory to Judaea and Idumaea. The Romans established an outsider, Herod as a king. Around 40-37 BC the Roman Senate gave Herod the title 'King of the Jews' and he governed Judaea for thirty-three years as an friend and ally of Rome. ↑ A History of the Israeli-Palestinian Conflict - Mark A. Tessler - Google Books. Books.google.com. http://books.google.com/books?id=3kbU4BIAcrQC&pg=PA401&lpg=PA401&dq=Judea+%22southern+part+of+the+west+bank%22&source=bl&ots=SAj30tHaZd&sig=31Ggk3L8C31toq9at7aa0Jim-CI&hl=en&sa=X&ei=gIbfUPazA7TW0gGOu4CgDQ&ved=0CFUQ6AEwBg#v=onepage&q=Judea%20%22southern%20part%20of%20the%20west%20bank%22&f=false. Retrieved 2013-07-17. ↑ Tenney, Merrill C, ed. (1967). Pictorial Bible Dictionary. Grand Rapids, Michigan: Zondervan Publishing House. p. 456. ISBN 0-310-23560-X. ↑ Pfeiffer, Charles F (1979). Baker´s Bible Atlas. Grand Rapids, Michigan: Baker Book House. p. 166. ISBN 0-8010-6930-0. ↑ Wood, D. R. W, ed. (1985). New Bible Atlas. Wheaton, Illinois: Tyndale House Publishers. p. 58, 67. ISBN 0-8423-4675-9. This page was last modified on 12 August 2014, at 21:04.